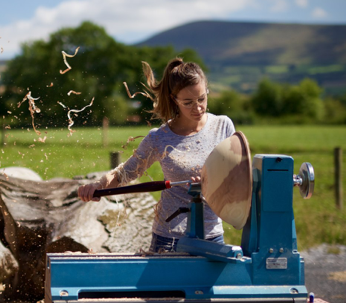 Ashley Harwood is a woodturner, instructor and installation artist. She turns utilitarian bowls, ornaments and jewelry. Her design aesthetic is heavily influenced by a background in glassblowing and her works are completed entirely on the lathe. She began woodturning at the suggestion of her father and apprenticed under Stuart Batty. Turning for over nine years, she’s traveled throughout the U.S., Eastern Canada, the U.K and Australia teaching and demonstrating her woodturning expertise. Ashley received her B.F.A from Carnegie Mellon University in 2004 with study abroad in 2001 through Kennesaw State University in Montepulciano, Italy in 2001 and in 2003 at the L’Ecole Nationale Superieure des Beaux-Arts in Paris, France.